Sighing definition: an involuntary inhalation that is 1.5-2 times larger than one’s usual tidal volume. Some medical authors write that sighs are at least twice as deep as one’s usual inhalation (Caughey et al, 1943; Wilhelm et al, 2001). Sighing may occur during sleep in normal infants (Gerard et al, 2002) and adults (Perez-Padilla et al, 1983). The later of these two studies on sighs found that all 12 adults being observed had 1 to 25 sighs per night during sleep. As seen in the image above, heavy breathing actually REDUCES the amount of oxygen in the brain cells. Breathing more than the medical norm (with a tidal volume of 500 mL) is by definition hyperventilation. “Hyper” (fast) + “ventilation” (breathing) literally means to breathe faster than the standard or norm. Since what matters (and dictates how much CO2 is removed from one’s body and, ultimately, how much oxygen is available to one’s body) is the amount of air breathed per unit of time, we interpret “hyperventilation” as breathing more than we should, faster and/or deeper than the norm. Sighing, then, since it is indeed deep breathing, is a (mild) form of hyperventilation. 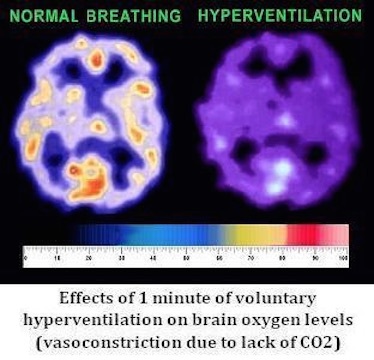 It will yield, on some scale, the same negative effects on the brain (and body) as pictured earlier (above): less oxygen in body cells, causing chronic disease and many other abnormalities. Those that sigh have less than 20 seconds for the body oxygen test. Once a person achieves 30 seconds of oxygen, sighing DISSAPPEARS. The body oxygen test is not some test with fancy machines in a complex laboratory setting. Rather, any person can do it with only a watch/clock to keep track of time. Due to a sudden CO2 increase experienced during breath holds, certain people are not able to safely perform this test. Most, however, do not experience negative symptoms (migraine headaches, dizziness, ect.) at all. First, rest for 5-7 minutes while sitting. Then, after a normal exhalation, (with your mouth already closed) pinch the nose closed. Count in seconds the duration of time before your body gives an initial distinct desire to breathe. Many feel a movement of the tummy and/or swallowing in the throat at this point. The number of seconds that you count is your oxygen level. The test should be stress-free with no gasping for air afterwards. On the contrary, your breathing should resume just as it was before. Due to training (like that which is done by professional divers), some people have very long MAXIMUM BREATH HOLDS. Such conditioning, however, has no effect on the body oxygen test and does not reflect one’s health. Therefore, it is irrelevant here.